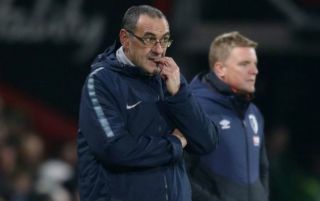 Chelsea are reportedly ready to consider sacking manager Maurizio Sarri imminently after the club’s latest poor showing in their defeat to Everton. The Blues lost 2-0 at Goodison Park this weekend in another tame display, with Sarri now looking likely to miss out on guiding the club to a top four spot this season. Given that Antonio Conte was sacked at the end of last season after Chelsea finished fifth in the Premier League, this truly is damning for Sarri, who has clearly failed to move the team forward. According to the Daily Express, this could now lead to Roman Abramovich pulling the trigger and changing his manager as we head into the international break. The Italian tactician shone at previous club Napoli but has struggled under rather different circumstances at Chelsea, where pressure is high and managers don’t get that kind of time to build a team. CFC could of course still catch up and clinch a Champions League spot as they’re only three points behind Arsenal in fourth, but they also have Manchester United to contend with and it’s hard to imagine they won’t slip to more disappointing results like the one against Everton.